In the months preceding the 2010 MLB Amateur Draft, LSU star pitcher Anthony Ranaudo was the consensus top pitching prospect in the country, baffling college bats with a blazing fastball and plus curveball. However, an elbow injury early in the 2010 season derailed Ranaudo for a month and upon his return the star prospect was noticeably far from his former self. Despite his spring struggles, the Boston Red Sox selected Ranaudo with their supplemental pick in the first-round of the draft, banking on his high ceiling and raw talent. 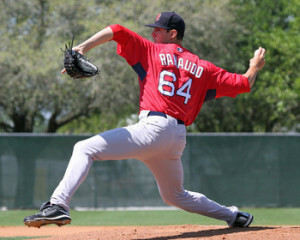 Following the draft that summer, Ranaudo would go on to dominate the Cape Cod League, garnering the attention he once commanded prior to the 2010 season. Analysts and scouts were impressed with his summer performance, projecting Ranaudo to become a future front of the rotation starter, many suggesting that the Boston right hander would reach the big leagues at some point in the 2012 season. However, those projections would be seen as rather premature, as Ranaudo would post a season that conveyed mixed emotions in 2011. Beginning his season at Low-A Greenville, Ranaudo pitched respectably well, posting a 4-1 record and 3.33 ERA along with a 50/16 strikeout to walk ratio in 46.0 innings of work. Although such numbers are solid at first glance, one can make the assertion that a seasoned college pitcher like Ranaudo would have been more dominant against Low-A batting. Upon his promotion to High-A Salem later that season, Ranaudo would witness a regression in his stuff. In 16 starts for Salem, Ranaudo posted a 5-5 record and 4.33 ERA along with a 67/30 strikeout to walk ratio in 81.0 innings of work. Ranaudo’s velocity and pitch movement had faded as the season progressed, as witnessed by his decreased strikeout rate (7.4 K/9 with Salem, compared to 9.8 K/9 with Greenville), slight increase in walks, and noticeable struggles with control. Ranaudo would carry over his struggles from High-A Salem to Double-A Portland, as lingering injuries and inconsistent play would limit him to nine starts in 2012. In those nine starts, Ranaudo pitched far from his previous billing, turning in a rather atrocious season. 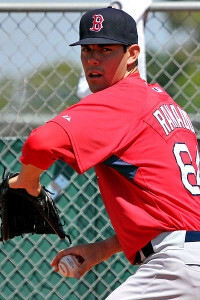 Ranaudo turned in a 1-3 record and 6.69 ERA, posting an alarming 27/27 strikeout to walk ratio in 37.2 innings of work. The Boston prospect was certainly an intriguing case, as he would pitch terribly with poor mechanics and shaky command of his pitches, while at the same time flash displays of his once heralded talent, displaying a diverse, yet plus arsenal highlighted by a mid-90s fastball with good movement. The capricious nature of his pitching led many to believe that Ranaudo’s struggles were primarily mental. Despite his poor 2012 campaign, Ranaudo has at times flashed a much more polished repertoire in games and practice sessions. Due to such assumations, Ranaudo was sent to complete a stint in winter baseball to refine the mechanics of his game, both physically and mentally. Whether winter ball succeeded in refining his overall approach to the game, Ranaudo came to a personal revelation, or a mixture of both occurred is all a matter of conjecture at this point, as Ranaudo has made a complete turnaround this season at Portland, regaining the command and dominance that made him one of the premier pitching prospects in the country just a few short years ago. In ten starts this season, Ranaudo has been dominant for Portland, baffling Double-A offenses with a plus arsenal consisting of a mid-90s fastball, sweeping curveball, and solid changeup with excellent sink and deception, all of which he can paint with great control across the plate. Ranaudo has posted a 1.48 ERA and 58/15 strikeout to walk ratio in 54.2 innings of work, along with an impressive 0.841 WHIP. On Wednesday, May 29 (his most recent outing), Ranaudo was dominant in a 9-1 victory for Portland. Ranaudo worked seven scoreless innings, surrendering just one hit and striking out eight batters. Whether he has risen back to status as a top pitching prospect with plus, pure talent can be debated, due to the fact that Ranaudo has only started ten games this season. However, in those ten games Ranaudo has put on a clinic, dominating offenses with his plus pitch arsenal. Based on the mechanics and stuff that he has displayed this season, it can be well assumed that Ranaudo has found his groove and is making the best of that rediscovery. If the Ranaudo “of old” is here to stay, the Boston Red Sox will boast one of the strongest pitching cores in the minors, along with top pitching prospects Matt Barnes and Rubby De La Rosa. The future of the Boston starting rotation looks bright and continues to shine brighter with the resurgence of Anthony Ranaudo.